This tutorial is the first in a series of a Visual Basic versions of the Getting Started with EF 6 using MVC 5 tutorials published on the www.asp.net site. The original series, produced by Tom Dykstra and Rick Anderson ( @RickAndMSFT ) was written using the C# language. My versions keep as close to the originals as possible, changing only the coding language. The narrative text is largely unchanged from the original and is used with permission from Microsoft. The tutorial series teaches you how to create ASP.NET MVC 5 applications using the Entity Framework 6 and Visual Studio 2013 Express for Web. This tutorial uses the Code First workflow. For information about how to choose between Code First, Database First, and Model First, see Entity Framework Development Workflows. 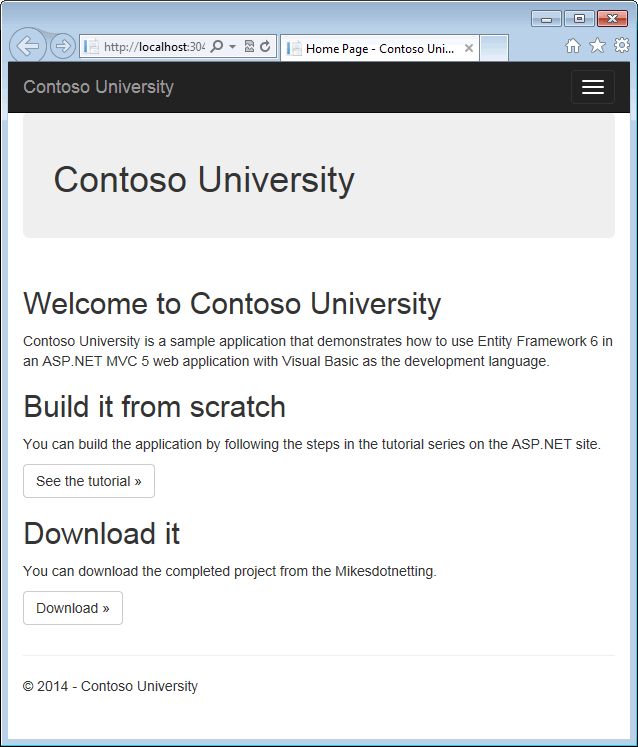 Open Visual Studio and create a new Visual Basic Web project named "ContosoUniversity". 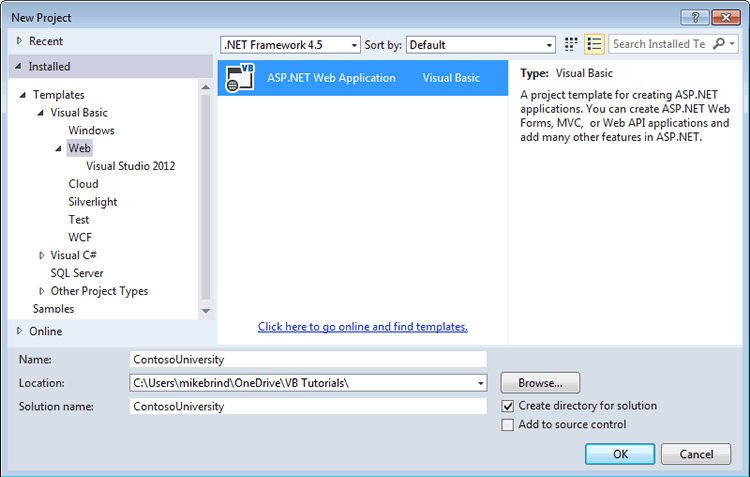 In the New ASP.NET Project dialog box select the MVC template. 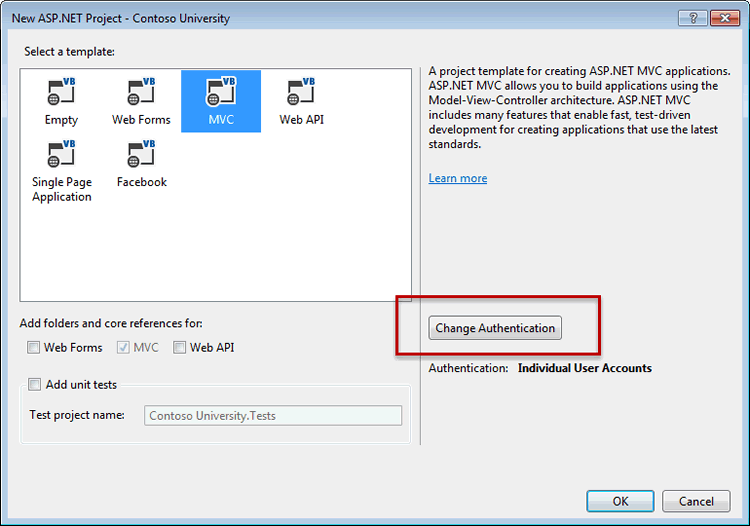 In the Change Authentication dialog box, select No Authentication, and then click OK. For this tutorial you won't be requiring users to log on or restricting access based on who's logged on. Back in the New ASP.NET Project dialog box, click OK to create the project. 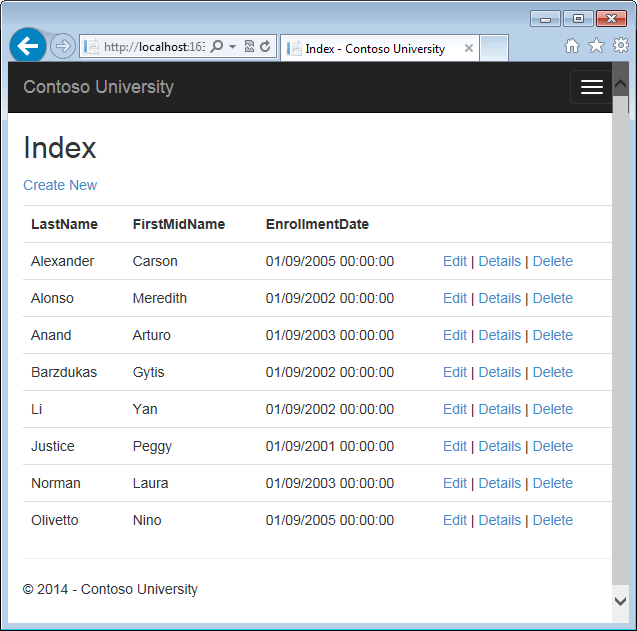 Add menu entries for Students, Courses, Instructors, and Departments. ASP.NET MVC 5 web application with Visual Basic as the development language. From the Tools menu click Library Package Manager and then click Package Manager Console. The image shows 6.1.0 being installed, but NuGet will install the latest version of Entity Framework (excluding pre-release versions. 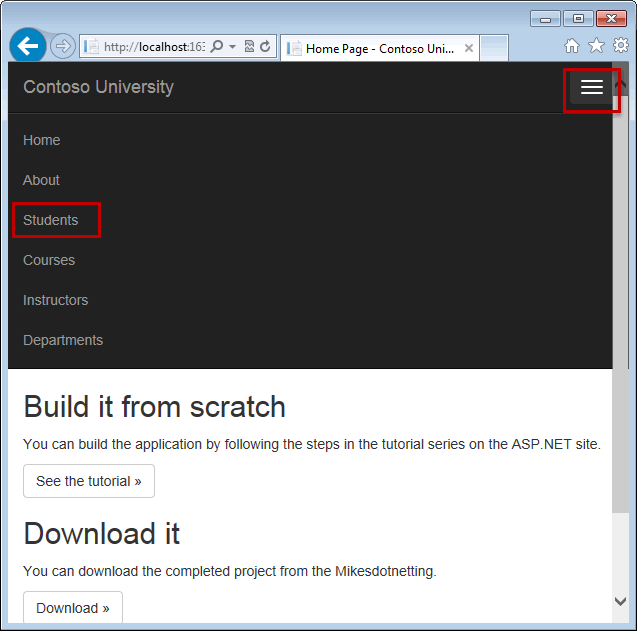 The next step is one of a few steps that this tutorial has you do manually, but which could have been done automatically by the ASP.NET MVC scaffolding feature. You're doing them manually so that you can see the steps required to use the Entity Framework. 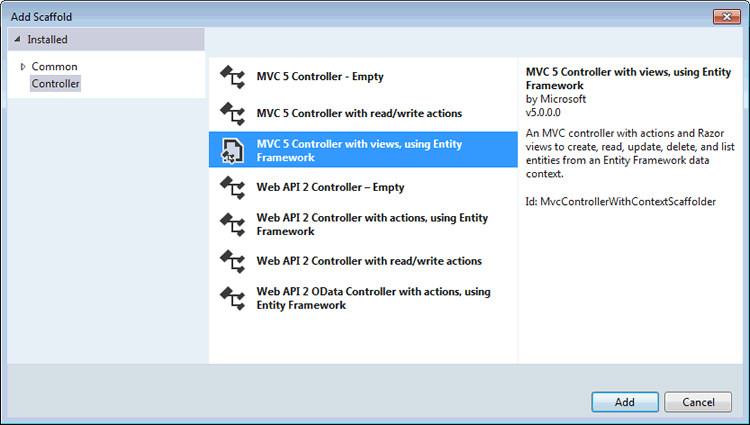 You'll use scaffolding later to create the MVC controller and views. An alternative is to let scaffolding automatically install the EF NuGet package, create the database context class, and create the connection string. When you're ready to do it that way, all you have to do is skip those steps and scaffold your MVC controller after you create your entity classes. Note If you try to compile the project before you finish creating all of these entity classes, you'll get compiler errors. The ID property will become the primary key column of the database table that corresponds to this class. By default, the Entity Framework interprets a property that's named ID or classnameID as the primary key. Public Property Grade As Grade? The EnrollmentID property will be the primary key; this entity uses the classnameID pattern instead of ID by itself as you saw in the Student entity. Ordinarily you would choose one pattern and use it throughout your data model. Here, the variation illustrates that you can use either pattern. In a later tutorial, you'll see how using ID without classname makes it easier to implement inheritance in the data model. We'll say more about the DatabaseGenerated attribute in a later tutorial in this series. Basically, this attribute lets you enter the primary key for the course rather than having the database generate it. You could have omitted the DbSet(Of Enrollment) and DbSet(Of Course) statements and it would work the same. 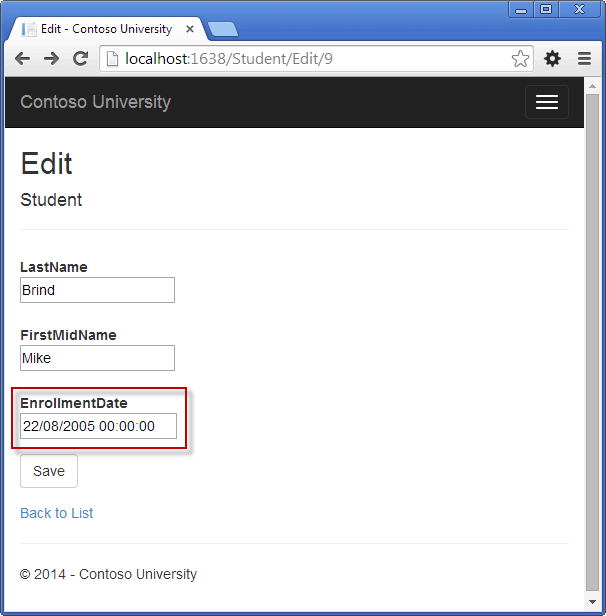 The Entity Framework would include them implicitly because the Student entity references the Enrollment entity and the Enrollment entity references the Course entity. You could also pass in the connection string itself instead of the name of one that is stored in the Web.config file. 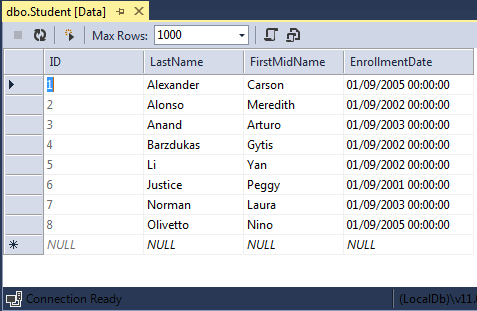 For more information about options for specifying the database to use, see Entity Framework - Connections and Models. The modelBuilder.Conventions.Remove statement in the OnModelCreating method prevents table names from being pluralized. If you didn't do this, the generated tables in the database would be named Students, Courses, and Enrollments. Instead, the table names will be Student, Course, and Enrollment. Developers disagree about whether table names should be pluralized or not. The original tutorial uses the singular form so we will stick with that- although my personal preference is the plural form, but the important point is that you can select whichever form you prefer by including or omitting this line of code, and once haivng made that selection, you should be consistent. The Entity Framework can automatically create (or drop and re-create) a database for you when the application runs. You can specify that this should be done every time your application runs or only when the model is out of sync with the existing database. You can also write a Seed method that the Entity Framework automatically calls after creating the database in order to populate it with test data. The default behavior is to create a database only if it doesn't exist (and throw an exception if the model has changed and the database already exists). In this section you'll specify that the database should be dropped and re-created whenever the model changes. Dropping the database causes the loss of all your data. This is generally OK during development, because the Seed method will run when the database is re-created and will re-create your test data. But in production you generally don't want to lose all your data every time you need to change the database schema. Later you'll see how to handle model changes by using Code First Migrations to change the database schema instead of dropping and re-creating the database. In the DAL folder, create a new class file named SchoolInitializer.vb and replace the template code with the following code, which causes a database to be created when needed and loads test data into the new database. The context type specifies the fully qualified context class name and the assembly it's in, and the databaseInitializer type specifies the fully qualified name of the initializer class and the assembly it's in. (When you don't want EF to use the initializer, you can set an attribute on the context element: disableDatabaseInitialization="true".) For more information, see Entity Framework - Config File Settings. As an alternative to setting the initializer in the Web.config file is to do it in code by adding a Database.SetInitializer statement to the Application_Start method in in the Global.asax.vb file. For more information, see Understanding Database Initializers in Entity Framework Code First. The application is now set up so that when you access the database for the first time in a given run of the application, the Entity Framework compares the database to the model (your SchoolContext and entity classes). If there's a difference, the application drops and re-creates the database. Note: When you deploy an application to a production web server, you must remove or disable code that drops and re-creates the database. You'll do that in a later tutorial in this series. LocalDB is a lightweight version of the SQL Server Express Database Engine. It's easy to install and configure, starts on demand, and runs in user mode. LocalDB runs in a special execution mode of SQL Server Express that enables you to work with databases as .mdf files. You can put LocalDB database files in the App_Data folder of a web project if you want to be able to copy the database with the project. The user instance feature in SQL Server Express also enables you to work with .mdf files, but the user instance feature is deprecated; therefore, LocalDB is recommended for working with .mdf files. In Visual Studio 2012 and later versions, LocalDB is installed by default with Visual Studio. The connection string you've added specifies that Entity Framework will use a LocalDB database named ContosoUniversity1.mdf. (The database doesn't exist yet; EF will create it.) If you wanted the database to be created in your App_Data folder, you could add AttachDBFilename=|DataDirectory|\ContosoUniversity1.mdf to the connection string. For more information about connection strings, see SQL Server Connection Strings for ASP.NET Web Applications. You don't actually have to have a connection string in the Web.config file. If you don't supply a connection string, Entity Framework will use a default one based on your context class. For more information, see Code First to a New Database. the creation of the database. You'll begin by creating a new controller. But before you do that, build the project to make the model and context classes available to MVC controller scaffolding. 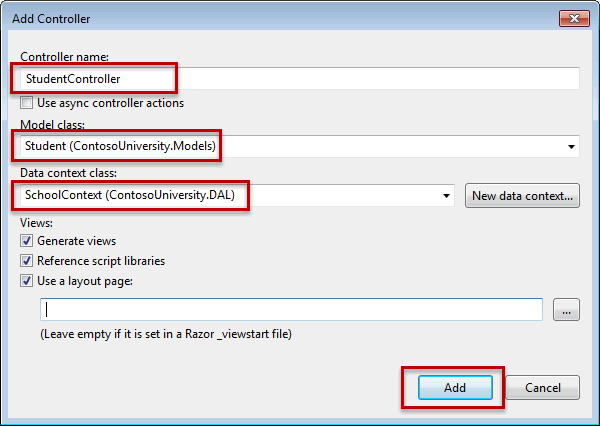 In the Add Scaffold dialog box, select MVC 5 Controller with views, using Entity Framework. When you click Add, the scaffolder creates a StudentController.vb file and a set of views (.vbhtml files) that work with the controller. In the future when you create projects that use Entity Framework you can also take advantage of some additional functionality of the scaffolder: just create your first model class, don't create a connection string, and then in the Add Controller box specify new context class. The scaffolder will create your DbContext class and your connection string as well as the controller and views. When you ran the Students page and the application tried to access the database, EF saw that there was no database and so it created one, then it ran the seed method to populate the database with data. 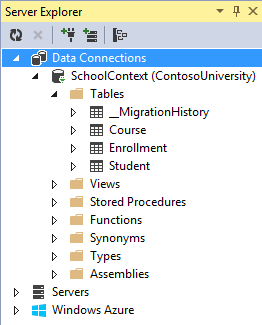 In Server Explorer, expand Data Connections, expand School Context (ContosoUniversity), and then expand Tables to see the tables in your new database. The ContosoUniversity1.mdf and .ldf database files are in the C:\Users\<yourusername> folder. Because you're using the DropCreateDatabaseIfModelChanges initializer, you could now make a change to the Student class, run the application again, and the database would automatically be re-created to match your change. For example, if you add an EmailAddress property to the Student class, run the Students page again, and then look at the table again, you will see a new EmailAddress column. Entity properties that are named ID or classnameID are recognized as primary key properties. You've seen that conventions can be overridden. For example, you specified that table names shouldn't be pluralized, and you'll see later how to explicitly mark a property as a foreign key property. You'll learn more about conventions and how to override them in the Creating a More Complex Data Model tutorial later in this series. For more information about conventions, see Code First Conventions. You've now created a simple application that uses the Entity Framework and SQL Server Express LocalDB to store and display data. In the next tutorial you'll learn how to perform basic CRUD (create, read, update, delete) operations.